European Roots and Economic Crisis. A lesson from Aquino Holy See makes one more step toward financial transparency. While a subtle battle is fought behind the curtains. Next year, an important anniversary will be celebrated in the Vatican: it will be the 50th anniversary of the promulgation of the encyclical Pacem in terris, by John XXIII. And the Vatican decided to celebrate the anniversary his way: inviting the General Secretary of the United Nations Ban Ki Moon in Rome, to discuss about the reform of the United Nations. The same reform that the Holy See aims to bring to a world authority with universal competences, that should consistently involve all peoples in a collaboration in which they are called to contribute, bringing to it the heritage of their virtues and their civilizations. «The attainment of the common good – John XXIII wrote in the Pacem in terris – is the sole reason for the existence of civil authorities. In working for the common good, therefore, the authorities must obviously respect its nature, and at the same time adjust their legislation to meet the requirements of the given situation». The reflections of the Pontifical Council for Justice and Peace - titled «Towards reforming the international financial and monetary system in the context of global public authority» and released the last October, at the vigil of the G20 in Cannes – highlighted once again the «world authority issue», since the Pontifical Council for Justice and Peace called for the advent of a new world centered on a universal political authority. The idea was not unprecedented. It was previously evoked in the Pacem in Terris. And Paul VI, in the encyclical Populorum progressio, wrote – in a paragraph meaningly titled Toward an effective world authority – that «such international collaboration among the nations of the world certainly calls for institutions that will promote, coordinate and direct it, until a new juridical order is firmly established and fully ratified. We give willing and wholehearted support to those public organizations that have already joined in promoting the development of nations, and We ardently hope that they will enjoy ever growing authority». 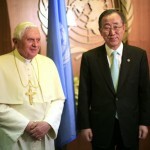 Finally, Benedict XVI evoked a reform of the United Nations in his encyclical Caritas in Veritate. «In the face of the unrelenting growth of global interdependence – Benedict XVI wrote – there is a strongly felt need, even in the midst of a global recession, for a reform of the United Nations Organization, and likewise of economic institutions and international finance, so that the concept of the family of nations can acquire real teeth. One also senses the urgent need to find innovative ways of implementing the principle of the responsibility to protect and of giving poorer nations an effective voice in shared decision-making». Where does the «global authority issue» come from? Holy See is highly attentive to the need for adequate institutions, and this institutions must – according to the Holy See vision – express the primacy and the responsibility of policy, and at the same time they must give effective voice to the largest number of nations. Today, the «global authority issue» is even more topical. The goal is to reach for the global common good. And to reach the global common good there is the need of global institutions, referred to people, to their Parliaments, to their juridical references. «The establishment of a world political Authority - Mario Toso, secretary of the Pontifical Council for Justice and Peace, said – should be preceded by a preliminary phase of consultation from which a legitimated institution will emerge that is in a position to be an effective guide and, at the same time, can allow each country to express and pursue its own particular good. The exercise of this Authority at the service of the good of each and every one will necessarily be super partes (impartial): that is, above any partial vision or particular good, in view of achieving the common good. Its decisions should not be the result of the more developed countries’ excessive power over the weaker countries. Instead, they should be made in the interest of all, not only to the advantage of some groups, whether they are formed by private lobbies or national governments». Today the Holy See will take part to the World Water Forum in Marseille. Holy See position is against the water as a commercial good, in favor of an enlarged right to the water (not enclosed only to the right to get potable water to drink, but enclosing the right to have water to use for food safety and personal hygiene). Holy See will also auspicate a global authority to manage the water. Now, the question is: will the Holy See propose a global authority for every single issue? In fact, what concerns finance, safeguard of the environment, peace, water and energy is global issue, and this is the reason why it needs to managed by global institutions. So, one should not think that the Holy See wants to promote a World Authority for each issue: Holy See auspicates an affective world authority, with universal competences, and not a World Authority for each specific competences. This World Authority would be the result of the reform of the United Nations. This reform – according to the Holy See – should be aimed to give certain and common good-oriented rules, to have true decisional powers and to deviate from the logic of G-meeting (G7, G8,G20), where the big leaders countries meet to take decisions, albeit they are not meeting with a political legitimacy, and this is exactly the reason why Holy See often criticized this international congresses – e.g. in 2009, the Holy See asked the Doha round to be enlarged to the opinions of the excluded countries. There had been several and different ideas to carry out a reform of the United Nations. In 1985, Marc Nerfin proposed a Governmental Chamber (present General Assembly), a Citizens Chamber and a Business Chamber (the multinational companies) as the new structure of the United Nations. Campaign for a UN reform (the lobby affiliate of the World Federalists in the U.S.A.) proposed a Second Chamber for the UN composed of the delegates selected by member States (in any way they wish, direct election being a possibility) on a modified population basis; and/or an advisory board of Parliamentarians, and/or NGOs representatives. Ken Coates of the Bertrand Russel Peace Foundation in London proposed in 1987 an elected Un consultative assembly. And Harry Lerner proposed in 1983 that the Un second assembly could be effectively implemented through a system of local community council and/or regional constituent assemblies, elected directly or through the local branches of NGOs and CBOs (Community Based Organization). Since the late 1990s, then, there have been many calls for reform of the United Nations (UN). However, there is little clarity or consensus about what reform might mean in practice. Both those who want the UN to play a greater role in world affairs and those who want its role confined to humanitarian work or otherwise reduced use the term «UN reform» to refer to their ideas. The range of opinion extends from those who want to eliminate the UN entirely, to those who want to make it into a full-fledged world government. On June 1, 2011, UN Secretary-General Ban Ki-moon appointed Atul Khare of India to spearhead efforts to implement a reform agenda aimed at streamlining and improving the efficiency of the world body. Khare, will lead the Change Management Team (CMT) at the UN, working with both departments and offices within the Secretariat and with other bodies in the UN system and the 193 member states. The CMT is tasked with guiding the implementation of a reform agenda at the UN that starts with the devising of a wide-ranging plan to streamline activities, increase accountability and ensure the organization is more effective and efficient in delivering its many mandates. Actually, all the reforms proposed are intended to give a better functionality to the United Nations. Holy See thinks to a wider reform. In 2009, while presenting to the press the encyclical Caritas in veritate, Stefano Zamagni, economist and consultor of the Pontifical Council for Justice and Peace, affirmed that «there is already a proposal for a second assembly of the United Nations (being the present General Assembly not sufficient) with representatives of co-ops, civil society and Churches». And – he added – «there is the need for the institution of a Social-Economic Security Council. As the present Security Council intervenes when any country threaten to throw bombs and make a war, there is the need of a second Security Council with the power to prevent speculation ». To better understand what kind of reform of the United Nations the Holy See would carry out, it is sufficient to go and see what Popes said when they visited and held speeches at the Glass Palace. Paul VI, in1965, remembered to the delegates: «Your Charter goes even farther, and our message moves ahead with it. You are in existence and you are working in order to unite nations, to associate States. Let us use the formula: to bring them together with each other. You are an association, a bridge between peoples, a network of relations between States. We are tempted to say that in a way this characteristic of yours reflects in the temporal order what our Catholic Church intends to be in the spiritual order: one and universal. Nothing loftier can be imagined on the natural level, as far as the ideological structure of mankind is concerned. Your vocation is to bring not just some peoples but all peoples together as brothers. A difficult undertaking? Without a doubt. But this is the nature of your very noble undertaking». Paul VI concluded his speech by underlining that «the edifice of modern civilization has to be built on spiritual principles, for they are the only ones capable not only of supporting it, but of shedding light on it and inspiring it. And we are convinced, as you know, that these indispensable principles of higher wisdom cannot rest on anything but faith in God». In 1995, John Paul II said: «Fifty years after its founding, the need for such an Organization is even more obvious, but we also have a better understanding, on the basis of experience, that the effectiveness of this great instrument for harmonizing and coordinating international life depends on the international culture and ethic which it supports and expresses. The United Nations Organization needs to rise more and more above the cold status of an administrative institution and to become a moral centre where all the nations of the world feel at home and develop a shared awareness of being, as it were, a “family of nations”. The idea of “family” immediately evokes something more than simple functional relations or a mere convergence of interests». 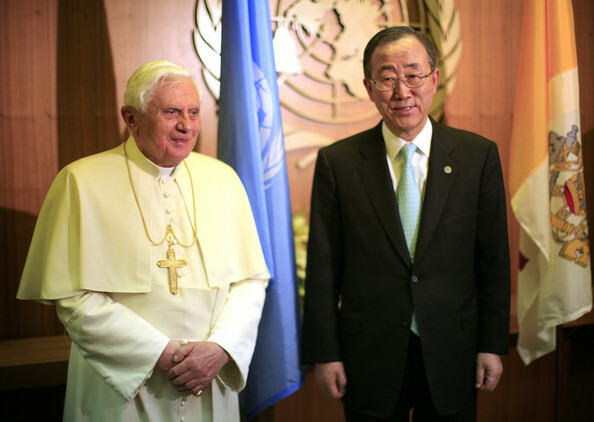 Finally, Benedict XVI went to speak to the General Assembly of United Nations in 2008. He affirmed that «the United Nations remains a privileged setting in which the Church is committed to contributing her experience “of humanity”, developed over the centuries among peoples of every race and culture, and placing it at the disposal of all members of the international community. This experience and activity, directed towards attaining freedom for every believer, seeks also to increase the protection given to the rights of the person. Those rights are grounded and shaped by the transcendent nature of the person, which permits men and women to pursue their journey of faith and their search for God in this world. Recognition of this dimension must be strengthened if we are to sustain humanity’s hope for a better world and if we are to create the conditions for peace, development, cooperation, and guarantee of rights for future generations». The differences among the three speeches are evident. In the meantime, the world had changed. After the fall of the Wall of Berlin, the two blocks of the Cold War had been replaced by a plurality of actors in the international scenario. In this new situation United Nations felt invested of the precise mission to promote practical priorities that – according to the advisors involved – would have led to a more rightful and free world. This new mission has been marked by a change of the dictionary of the United Nations, a new language to sustain this new mission, whose keyword where, for example: human globalization, sustainable development, good governance, world ethic, cultural diversity, dialogue among civilization, quality of life, gender, equal opportunities, homophobia, sexual orientation, safe abortion, etc. While this new dictionary prevailed, the words that belong to the Christian-Judaic tradition have been in some ways excluded: truth, moral, conscience, reason, earth, will, parents, spouse, husband, mother, father, son, daughter, chastity, complementariness, service, authority, hierarchies, law, commandment, dogma, sin, nature, marriage. With Christian realism, Holy See –sustained by Benedict XVI vision – is working to follow the utopia of a global common good and integral human development. Holy See statements are the only ones, in the international concert, that speaks about an «intergenerational pact». Obviously, it is a hard and slow work: Holy See make step-by-step proposals, trying to establish International institutions that are a sort of mini-realizations of what the future would ideally be. A future of solidarity and subsidiarity, as the Pope outlined in 2008, when he received the participants in the plenary assembly of the Pontifical Academy of Social Sciences, who met to study the theme: «Pursuing the common good: how solidarity and subsidiarity can work together». Solidarity and subsidiarity – the Pope said – «have the potential to place men and women on the path to discovering their definitive, supernatural destiny. … The responsibility of Christians to work for peace and justice, their irrevocable commitment to build up the common good, is inseparable from their mission to proclaim the gift of eternal life to which God has called every man and woman». This discussion – the Pope assured – «will be of service to all people of good will, while simultaneously inspiring Christians to embrace more readily their obligation to enhance solidarity with and among their fellow citizens, and to act upon the principle of subsidiarity by promoting family life, voluntary associations, private initiative, and a public order that facilitates the healthy functioning of society’s most basic communities. When those responsible for the public good attune themselves to the natural human desire for self-governance based on subsidiarity, they leave space for individual responsibility and initiative, but most importantly, they leave space for love, which always remains ‘the most excellent way’».